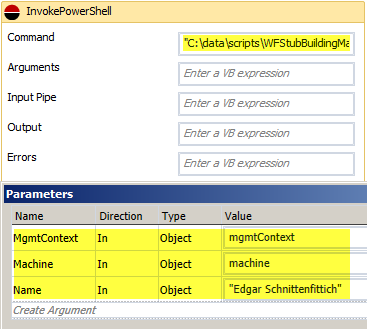 You have read all the blogs like Calling Powershell/PowerCLI Scripts from a vCAC workflow on how to call PowerShell scripts from vCAC or -if you really have to- vCO (when using the new vCAC plugin for vCO)? And you think it’s a cool feature? However, you have a bad feeling when it comes to testing as you cannot debug them in your favourite IDE (eg Windows PowerShell ISE) but instead have to fire and forget them (something a vCO programmer has got used to it over the years)? Don’t – there is help. As you can see there is no need to specify parameters with their exact types; [Object] is totally sufficient. And you also notice that we do not pass down any properties, as the machine object already contains everything we need (for readonly we keep them in a hashtable ‘$hp’). [string] $someOtherParam = "Peter Lustig"
If you do not use our vCAC PowerShell module you would define the first parameter as ‘mandatory=$true’ and not specify a default value. You then just have to pass the parameter explicitly when you call this script interactively. Both aforementioned properties are just plain properties you can set on the blueprint, during the machine request, in a build profile or some where else. Whereever you place the properties if ”biz.dfch.PS.vCAC.ExternalWFStubs.Debug’ is set to ‘True’ the Stub scripts will wait in all provisioning steps. If you only want to wait in certain step you just set the ‘biz.dfch.PS.vCAC.ExternalWFStubs.BuildingMachine.Debug’ property to ‘True’. When the scripts waits it will look for the the file in the same directory where the script resides appended with the virtual machine guid, eg: ‘C:\data\scripts\WFExternalStubs.BuildingMachine.ps1-56d6c853-f468-4c18-811e-749345106dc5’. When you create that file within 30s the script will wait until you delete it (or vCAC times out your script). With your vCAC script waiting you can now either start another instance of that script in your IDE and debug it step by step getting the same results as if it executed non-interactively. Footnote 1: you do not have to use our logging module. Just would then need to remove the ‘Log-*’ calls. Footnote 2: When working with more than one DEM Worker if might be tricky to find out where your script is actually executed. You might want to narrow it down by using skills on the DEM workers and workflows.